NEW RELEASE! ~ Pan: A Neverland Novel by Gina Maxwell is Available Now! Genre: Dark Romance, Modern Day Fairytale Retelling ~ *Check out giveaway! From New York Times and USA Today bestselling author, Gina L. Maxwell, comes a brand-new series with a fresh twist on an old classic. Once upon a time, in Neverland, North Carolina–I fell in love. We were magnetic, drawn to each other from that very first night, and what I thought would be forever. But when it came time for me to leave, he wouldn’t come with, so I left town with a map for my future and a shattered heart. Ten years later, I’ve returned to Neverland, hoping to find a man in place of the boy. Peter was partially right, growing up is no fun. After quitting my fancy career that sucked the magic out of life, I’m now organizing the fundraiser of the year. In a move that could make or break the event and my new company, I’ve hired Peter, master mechanic and owner of LB Automotive, to help me pull this off–trusting him to rebuild a classic car for the auction that could help hundreds of foster kids in need. But that ripped body doesn’t mean Peter’s matured enough to make us or this event work, and not everyone in Neverland is happy about my return. And after all this time, the love we found might be lost to us again…this time, forever. *Pan is an adult contemporary romance retelling of Peter Pan, complete with Wendy, Hook, Tink, and all the Lost Boys. There are no fantasy elements in this world, other than the “magic” that happens between the sheets. 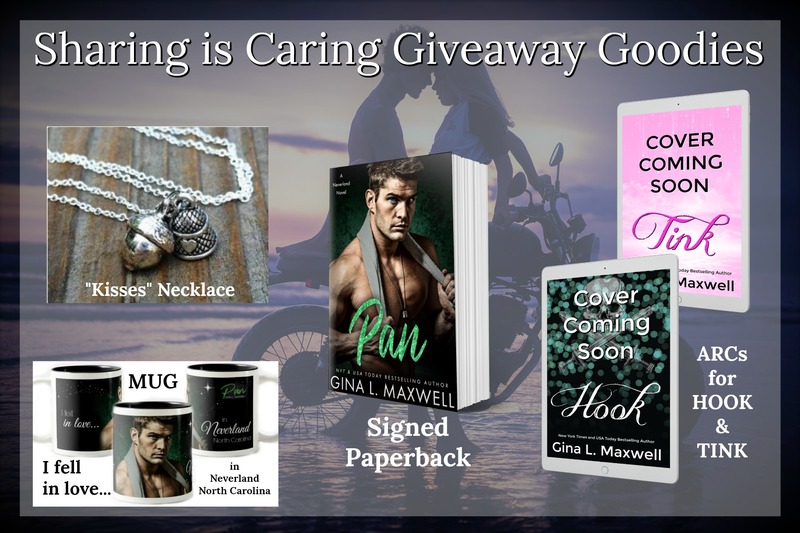 Share the Pan Love Giveaway Contest: For your chance to win a Pan-inspired prize basket, head to details page on Gina’s website for instructions on how you can earn points just for sharing release posts!